On last week’s episode, things got a bit out of hand at Cloud 9 (shocking!) when Jonah decides he doesn’t want to work a shift assignment. He’s been assigned to the gun counter which he’s morally opposed to. After some back and forth, Amy says that since it’s against his beliefs, he can be assigned elsewhere. This sets off a chain reaction among the staff. Mateo doesn’t want to be assigned to fitting rooms (“they’re basically just fart capsules”), and Sandra doesn’t want to be assigned to menswear because everything there reminds her of her ex, Brian. Amy tries to explain to the staff that you can’t just decline a shift assignment willy-nilly; the only reason Jonah’s been granted permission is because he’s morally opposed to guns. Glenn chimes in too, stating that he totally understands Jonah’s hesitations, and he’d feel the same way if the store sold, say, the morning after pill. Dina is quick to point out that the store DOES carry the morning after pill, much to Glenn’s horror. To put a cap on the madness, Amy says no one can change shifts, including Jonah, who is not happy about “instruments of death duty.” Jonah immediately has a hard time behind the gun counter. He’s not comfortable handling the guns or bullets, convinced the gun will randomly go off. Then a customer comes in who seems slightly dangerous. Unsure what to do, Jonah asks Amy who tells him that he is allowed to deny service to anyone who seems suspicious. Jonah, of course, takes this to the extreme, and starts refusing service to every customer who approaches. This causes immediate complaints from customers and when Jonah still doesn’t desist, owners start flocking in with their guns and form an open carry protest. Things get pretty heated, but Amy gives everyone a stern talking to and manages to alleviate the situation. 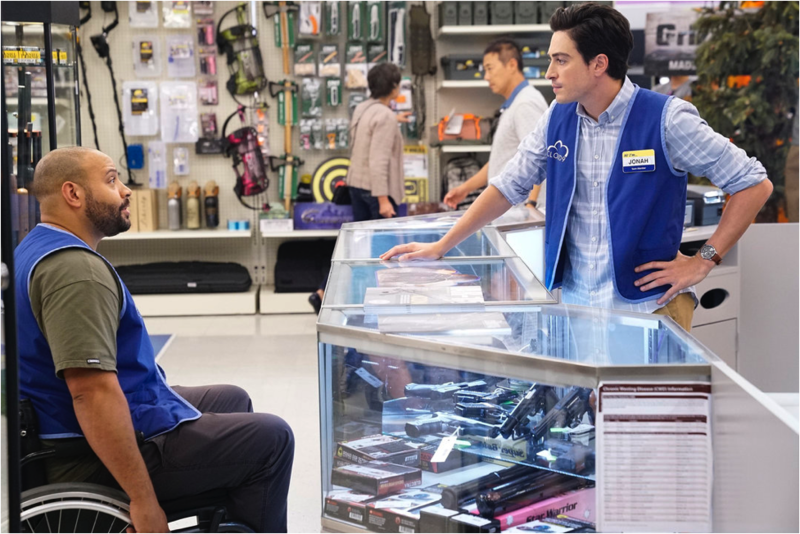 Over in pharmaceuticals, Glenn tries to convince the pharmacist, Tate, to stop selling the morning after pill. At first, he assumes Tate is just as opposed to it as he is, but he’s mistaken. Tate is, apparently, a big fan. Then Glenn tries to convince Tate to say they’re expired, which Tate refuses to do. Unable to get the pill off the shelves, Glenn stakes out the pharmacy counter. When the first couple approaches wanting to buy the pill, he swoops in, trying to convince them of the joys of parenthood. When that doesn’t stop them from wanting to buy it, he cuts in line in front of them and buys up all of the morning after pills, which costs over $1,100 ($40 per pill). When Glenn realizes the price, he tries to return them but Tate gleefully tells him that it’s illegal to return pills, as he could have tampered with them. To get rid of all the pills, Glenn lays his moral objections aside and tries selling them to any customer passing by for $50 a pill. Unfortunately for Glenn’s budget, this doesn’t work. Meanwhile, a gigantic crow has meandered into the store. Garrett, we find out, is terrified of birds. He enlists the help of Mateo and Dina. Mateo is inclined to kill the bird, but Dina — who is a bird lover — plans to catch it humanely and set it free. They create a path of bird seed leading out of the store, which does manage to lure the crow out the door, but also causes a dozen more crows to swoop in. Garrett tries hiding in a camping tent that’s on display. He zips himself inside but unfortunately, there is a crow inside the tent which is no happier to be locked in a tent with a human than Garrett is to be locked in with it. Dina then tries imitating the sounds of crows’ natural predators over the loudspeaker but this doesn’t work either. Crows are swooping everywhere. Garrett has abandoned the tent and is eating some fries at the Cloud 9 restaurant. A crow joins him and starts nibbling on his food. Watching it eat his lunch, Garrett decides the crow isn’t so bad, and proceeds to have a conversation with it about all the silly things Jonah has ever said or done. Dina sees the crow sitting there with Garrett and manages to capture it in a plastic bag. She hands the bag off to Mateo and tells him to “take care of it.” Mateo has a very different idea of what this means than Dina. While Dina talks to Garrett (who has a new appreciation for birds) about how wonderful they are, Mateo can be seen in the background slamming the plastic bag into the ground. Dina finishes her conversation with Garrett and approaches Mateo, telling him it’s time to set the bird free. Mateo, realizing she never meant to kill it, is horrified. But it’s too late. Dina has grabbed the bag and quickly discovers the poor bird has been murdered. The episode ends on that rather dramatic and horrific note. 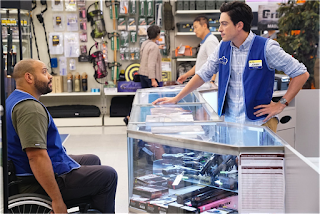 I’m pretty sure the Superstore creators wrote this episode with the intent to offend pretty much everyone, and if the characters weren’t all so lovable and adorable, they may have succeeded.